TORONTO -- A $17-million interactive digital media tax credit from the Ontario government helped pare Postmedia Network Canada Corp.'s second-quarter net loss to $1.3 million from a loss of $28.5 million a year earlier. 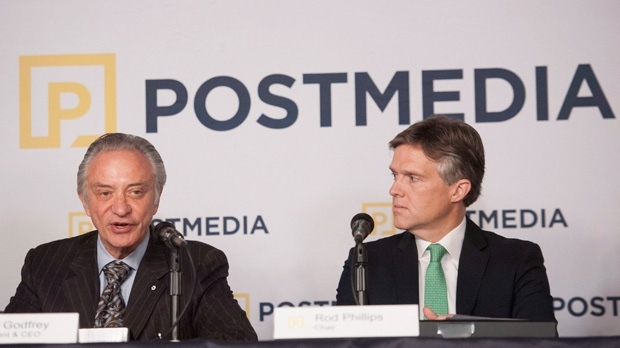 However, Postmedia executive chairman Paul Godfrey said that was the last quarter for the tax recovery because newspapers were specifically excluded in the 2015 Ontario budget. Instead, he hopes continued lobbying of all levels of government will lead to financial support and "ultimately the preservation of distinctly Canadian brands and voices." Godfrey singled out Quebec, which announced in its recent budget that it will spend about $36 million to help newspapers in the province, including about $19 million to aid their transition to digital platforms. "We are hopeful that this may inspire support from other provincial governments and even perhaps our federal government to help made-in-Canada industries level the playing field," he said during a conference call. Federal Heritage Minister Melanie Joly unveiled a cultural strategy in September that lacked measures to boost newspapers. She said Ottawa had no interest in bailing out industry models that are no longer viable. Ottawa was called upon to tax foreign companies selling digital subscriptions in Canada, create a $400-million fund to help finance reliable news and information and provide a five-year tax credit to partially offset digital investments by print outlets. Feburary's federal budget included $50 million over five years to support "local journalism in underserved communities," and plans to explore new models that would allow private and philanthropic support for "non-profit" journalism, including allowing Canadian newspapers to receive charitable status. Postmedia's net loss for the three months ended Feb. 28 was down despite a continued decline in revenue at its newspaper operations as the company continued its focus on cutting costs, partially through the closure of several community newspapers between November and January. The Toronto-based company, which owns the National Post and numerous other paper and digital publications, said its operating expenses were down 21 per cent or $36.2 million. The company said it was granted the $17 million media tax credit in February after refiling its tax returns relating to previously recognized compensation expenses between September 2012 and April 2015. Excluding the tax recovery claim, expenses excluding depreciation, amortization, amortization, impairment and restructuring decreased 11.1 per cent or $19.2 million. Those positives offset a 10.8 per cent decline in revenue to $157.6 million, which was down $19.1 million from last year's fiscal second quarter. Print advertising revenue was down $16.3 million, or 18.8 per cent, while print circulation revenue was down $4.6 million or 7.9 per cent. Godfrey said that the revenue declines from its legacy business had slowed and the company "is making some progress" from its digital advertising initiatives. "I didn't take this job to attend a funeral at some point in time," he said, noting other newspapers are facing similar challenges. Digital revenue -- which includes national and local display advertising, classified advertising on Postmedia's newspaper and other websites such as canada.com and canoe.com, and subscriptions -- totalled $26.4 million in the quarter, up 10.1 per cent from the same time last year. Shortly after the quarter ended, the Competition Bureau obtained a warrant to search one of Postmedia's offices as part of an investigation into an asset-swap with Torstar Corp., owner of the Toronto Star and other publications. No charges have been laid and the allegations included in the court documents have not been proven in court. Torstar and Postmedia have said they do not believe they contravened the Competition Act and they are co-operating. Under the agreement announced by the two companies in November, 41 newspapers changed hands and 36 were closed, mainly in Ontario regions served by multiple publications. Nearly 300 jobs were cut as a result. In documents used by the bureau to obtain warrants to search several offices of the two companies, the watchdog alleged they conspired to divide up sales, territories, customers and/or markets for advertising or flyer distribution in certain regions. The bureau also said the companies had lists of which Torstar and which Postmedia employees would be terminated and agreed to a transitional services agreement. Postmedia said Wednesday that it had incurred $3.5 million of severance costs over the six months ended Feb. 28, mostly in its first quarter ended Nov. 30. Over the two quarters, it also recorded about $1.7 million in provisions for onerous leases and contracts and $500,000 in acquisition costs related to the Torstar transaction. Torstar holds an investment in The Canadian Press as part of a joint agreement with a subsidiary of the Globe and Mail and the parent company of Montreal's La Presse.